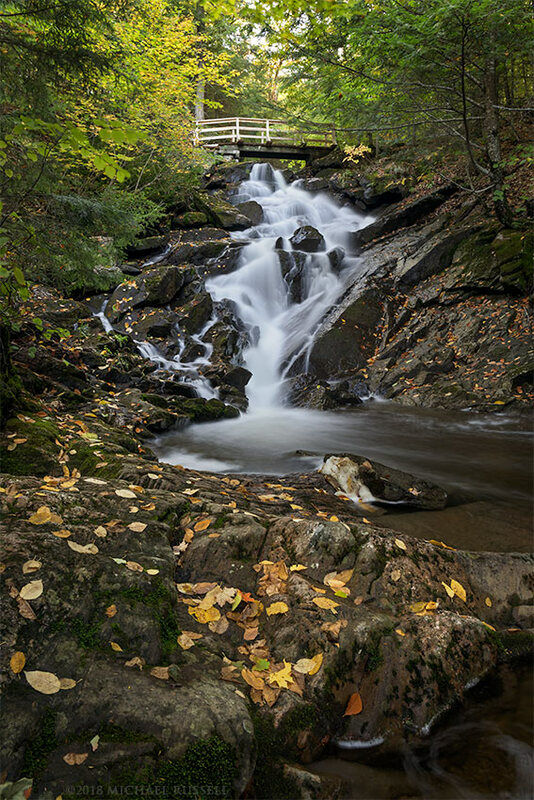 Dunlop Falls on Fortune Creek in Gatineau Park, Québec, Canada. There are a few nice waterfalls in Québec’s Gatineau Park and Dunlop Falls is probably the easiest to access. After just a short walk up from the parking lot the trail heads along Fortune Creek (Ruisseau Fortune in French) which leads you up to the main falls. 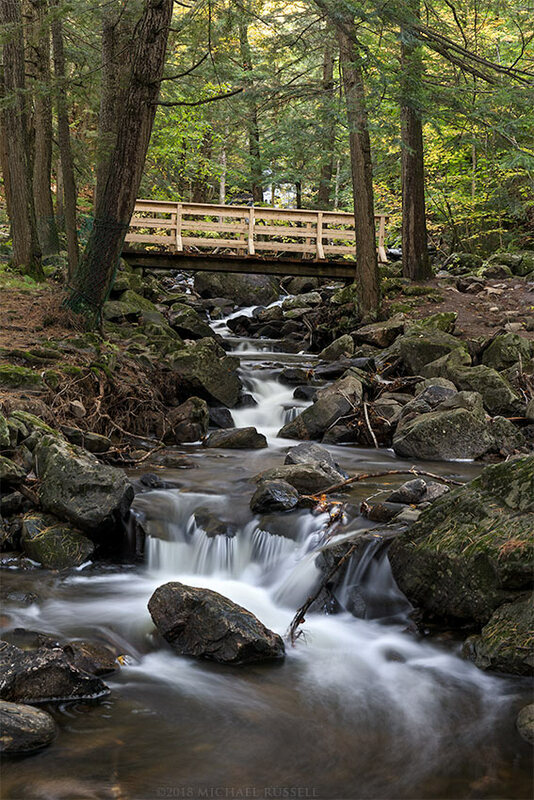 Fortune Creek has a few nice scenic spots itself even before you reach the falls, such as this stretch where a bridge on the Dunlop Trail crosses the creek. You can just see Dunlop Falls through the trees above the bridge in the photo below. After just a few minutes we reached Dunlop Falls itself. As can often be the case in popular locations such as this, I had to wait for a while for another photographer to clear the bridge above the falls. After maybe 5 minutes they were satisfied and moved on, which had given me time to work out a composition I liked. While the fall foliage here was not spectacular, there is a bit of colour, and the fallen leaves covering the rocks do convey an autumn feel even without a lot of colourful leaves in the trees. I made a few different compositions from that location before heading up the brief, steep, climb to the bridge above the falls. 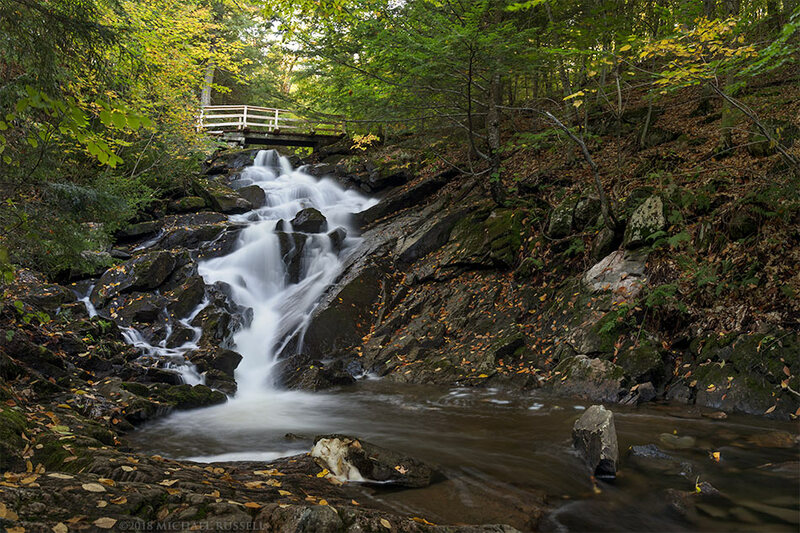 The best view of these falls is from just below the bridge, but there is a view looking upstream along Fortune Creek as well, though that area is probably better to photograph with more water in the river. After photographing from the bridge briefly, we headed down the other side of the river to go back to the parking lot. Before visiting here I looked at a lot of park maps and tried to get a good handle on what points of interest were around. This last photograph shows a bit of a surprise. The creek here on is on the map, but is not named, and there is no indication of the waterfall itself either in the maps. After my trip I went through about every topographical map I could find in the hopes of discovering the name of the creek and or the falls. I came up with nothing. In a last ditch effort to name these I phoned the Gatineau Park Visitors Center. They were well aware of this waterfall and the creek, but indicated they had no names for them. So I decided that I’d just name it anyway, and chose “Fortune Falls” as Camp Fortune is nearby and the Fortune Parkway is just above the falls in this last photograph. Photographing this spot was a bit of a challenge. As with many nature scenes, there is a lot of chaos, with branches and twigs sticking out of the water and all over the bank. A nice, neat, composition was not really going to be had here. 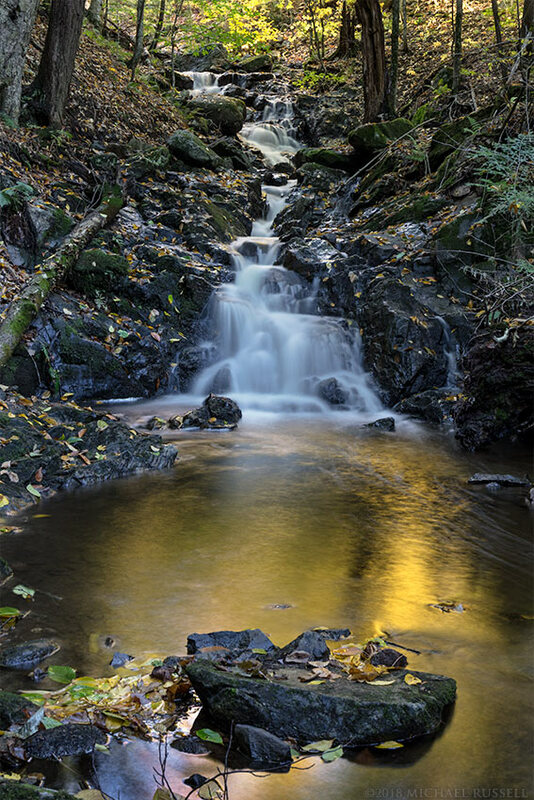 Other than the waterfall itself, the yellow/gold reflection in the water attracted me to this scene. The difficult part was including the brightly lit foliage above (along the Fortune Parkway) that was providing the color in order to give the reflection some context. Without it one might be tempted to ask why the water there is yellow and the rest of the scene is not. There was bright sunshine on much of this foliage, however, so I included just a bit of it for context. Hopefully the image above and the other shot of Fortune Falls in my image library convey where the coloration is coming from! For more photographs from this area visit my Gatineau Park gallery in my Image Library.